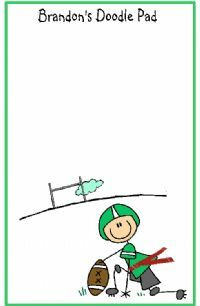 Stick Figure Flag Football Kids Notepads. Our Kiddie Doodle Notepad measures 5 1/2 x 8 1/2 and has 40 sheets. Notepads are wrapped in plastic and have a bow around them! Carries Kiddie Doodle Notepads are perfect for kids doodles, school notes, and sending notes to friends and family. My son also loves kiddie doodle notepads for practicing his writing. Enter personalization for Personalized Notepads Here!